All of this advice has been paid for, either dearly or cheaply. May you use it and prosper. If your business idea has a “chicken-or-the-egg” problem (meaning the adoption problem of: we will have a great product if, and only if, a lot of people are using it, but nobody is going to start using it because nobody is using it yet), 100% of your business idea must be about overcoming this problem. Solving the adoption problem must be The Idea. The great features you’d add to make the product even more useful once it has already become useful (and valuable) are irrelevant. The codicil is: A lot of value is created by standardization/critical mass. The fact we all use the same online encyclopedia creates a lot of value. To use Bob Metcalfe’s example, the fact we all use the same fax machine standard creates a lot of value. De facto and de jure standards create a lot of value. Nobody is debating that. But your ability to capture that value is in direct proportion to your contribution in bringing about that standardization. So do not distract yourself by spending a lot of time thinking about or talking about all of the intricacies and contours of the value that would exist if your standardization/critical mass occurred. If you are hiring a software developer: make them code as part of the application process. The number of people applying to be programmers that can’t actually program is astounding. My analogy is that some of these people can talk beautifully about literature in the interview despite their being functionally illiterate. The tax treatment of an acquisition can have a significant impact on the effective valuation of the deal. The details of these tax treatments are rarely disclosed in the filings. Yes, this means your painfully precise “comps” may not be all that accurate. Market neutral strategies often require being long one security and short another. Institutional investors should be extremely wary of creating a portfolio of hedge funds because one fund can be long one security and short another and the other fund could have the opposite bet. This means as the institutional investor you’ve arbitraged your way to paying performance fees on which every fund picked the winning side. Obviously the ideal; get as close as you can. 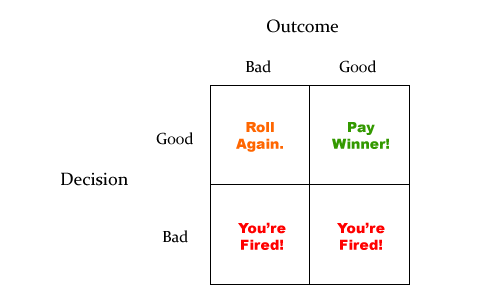 The real tricky one is Bad Decisions leading to Good Outcomes. See: AIG Financial Products group for case study on consequences of not firing. Sometimes that faint sound of a twig cracking in the forest is nothing, sometimes it’s a mountain lion. Extreme reactions to very small signals can be justified. Success on an initiative or a project is a lot rarer than generally people think it is. One undeniable, unmitigated win is infinitely better than five projects that are all “looking very good.” So don’t start a bunch of new project once one is looking good; rather focus on the current project and really run down the win. In strategy it is possible to rely too much on position (static). Winning the day often requires clutch performance at the critical moment (dynamic). Don’t rely too much on the dynamic but don’t excluded it by focusing solely on the static. The inverse of a conditional is not inferable from the conditional. That is, if [latex]A \rightarrow B[/latex] is true, it doesn’t necessarily follow that [latex]\neg B \rightarrow \neg A[/latex]. A: 4, to a high degree of certainty. Does Wittgenstein matter? Did Wittgenstein ever matter?